If you’re like most people, paper clutter is taking over your house and causing you a ton of stress. Despite your best efforts to organize your paper clutter, you just can’t seem to stop the bleeding. I’m about to tell you the unconventional organizing tips for paper clutter that will let you regain control once and for all. 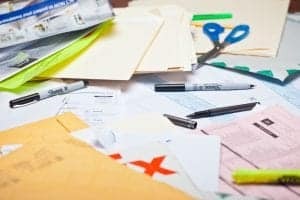 Why is Paper Clutter a Problem in Your Home? Tell me why you have paper everywhere. Because it comes into your house in droves. A nice man or woman drops off even more of it for you every day. You get a handy little piece of paper every single time you buy anything. Your kids bring home stacks of it from school. Then, you keep it to remind you to do things – like pay bills (pretty important), or you keep more of those papers “just in case”. The problem with paper is that it’s freaking overwhelming to look at. How do you stop yourself from losing an important piece of paper when you don’t have a file system that works? You put it all in one place, that’s how. Stick with me…this is about to get good! Right now, I want you to grab a cardboard box or plastic tote like this one and dedicate it to all of the paper in your house. We’re not going to file it right now (I’ll teach you how to organize it later) but we’re going to corral it in one place. I have an awesome paper filing system that will get you organized REALLY quickly, so don’t stress too much about making an overwhelming mountain of paper that you’ll have to deal with later. While you’re throwing all of that paper into a box, throw away the obvious garbage. This includes the fast food coupons you might use someday, the envelopes things came in, the credit card offers, etc. If it’s not a school paper, a bill, or some sort of warranty information, it can probably be tossed. DO NOT, I REPEAT DO NOT, GET HUNG UP ON THIS STEP. We are corralling paper here, not choosing which of our children to give up for adoption. Get that paper in a box, move FAST, and move on. We’re making quick progress here and we don’t want paper to continue to control our lives. Just conquering paper clutter will make an unbelievable difference in the appearance of your home. I’ve been very honest about the fact that I DO NOT consider digital clutter to be a problem. In fact, I’d much rather have digital clutter in my inbox than on my countertops. The habit I’ve developed that has made the biggest difference in the amount of paper clutter in our home is taking pictures of random papers I think we might need or bills that need to be paid that I can’t sign up to get electronically. If there isn’t a real reason to keep the physical paper, I’ll get rid of it after I take a picture. Then, I just email myself the picture, save it in an “action items” folder in my email, and either delete the picture or move it to a “completed” folder after I’ve taken action on it. This is perfect for invitations to events like weddings or birthday parties. You need to know the time and location and certain specifics like where to park, what to wear, etc. In this case, I’d take a picture of it, email it to myself, add it to my calendar, and delete it from my email as soon as the event is over. It takes just a few seconds, but it really keeps that paper clutter box from filling up with stuff that will never ever need filed or referenced again. Before we can even think about a filing system, we need to first stop the bleeding. You’ve already put all of your paper clutter into one box in step one, but now we need to develop a routine for the paper that is going to keep inundating your house. I’m not going to tell you to switch to online bill pay for all of your invoices or to unsubscribe from magazines…we’re going to adapt this system to your current lifestyle instead. The last thing I want is for you to start paying late fees for bills you couldn’t find because they were hiding in your inbox. We’re going to open and sort all mail the second it comes into the house over the recycling or shredding bin. We’re going to put ALL paper in ONE bin going forward. I’m not saying it isn’t beneficial for some people to have a specific areas for papers broken down by their purpose (“to be paid”, action items, coupons, etc. )…but at the end of the day, paper is paper. I want you to have just ONE spot to look when you’re digging around for a certain bill or document. Extra credit is absolutely to minimize the amount of paper coming in. Don’t pick up that free house magazine at the grocery store because you just love the front porch on that house on the cover. Also, pass up on all flyers at the grocery store unless they have coupons you need or you are sure you can’t find the same flyer online. Aldi is a prime example. We used to always grab the flyer for the following week on the way out the door – only to have them litter our trunk because we left them in there when we put away our groceries. Now, I check out the Aldi flyer on their website. Start thinking twice about any paper you allow into your home. Now, let’s tackle the papers we already have. I really love the filing system developed by Freedom Filer, but it’s somewhat expensive and not necessarily all of the tabs or sections you’re paying for will be useful to everyone. You can take a look at www.freedomfiler.com and check out the tabs they suggest. Even if you decide not to use the Freedom Filer system, there are so many techniques you can take away from their method that will completely revitalize how you handle your paperwork. It’s COMPLETELY changed mine. We don’t lose anything anymore…well…almost never. We do have two toddlers. Permanent Files – for things like the title to your car, mortgage documents, etc. Remove / Replace – for things like insurance, mortgage/rent, etc. I know it sounds confusing, but stick with me here. I’m about to tell you why this system is amaze balls and necessary to conquer your paper clutter. The main point of this system is to file by date, not item. Instead of filing all of your electric bills in one folder titled “Electric Bills”, you’ll be filing everything by month. You’ll have 12 folders for this year. If you decide to create your own filing system and implement nothing else, let it be the even/odd year monthly folders. It makes so much sense because when you’re looking for a document, you are far more likely to know when you received it, than anything else. When you need to find a receipt for a warranty issue, for example, you’ll remember you bought that TV in November…so you’ll go looking in the November folder instead of trying to dig through all of the receipts in a receipt folder or something crazy. Does this sound like it’ll work for you? This system is basically self-purging! This year, everything will stay in the even year folders for 2018. Next year, we’ll use the odd year folders for 2019. Then, in 2020, we’ll move everything from 2018 into the folder marked Year 1 and continue on with filing all papers from 2020 accordingly. Why does a system like this conquer paper clutter? In 2020, you’re going to shred all of your 2018 paperwork like bills and invoices that are no longer necessary while all of the 2018 important things live on in the other files – like mortgage documents in the permanent files and 2018 tax documents in your tax archives. There’s never any question about where to file a paper again. Haven’t you ever had one of those moments where you have a random paper that you know is important enough to keep, but it doesn’t fit in any of your current folders? So, you either pick your best fit and hope you remember where you hid it from yourself when you actually need it or you stick it in the front of your filing cabinet and hope you remember where it is. After you implement these techniques, you’ll never again face this dilemma and will always know just where to look to find any paperwork you need. I really encourage you to go to the Freedom Filer website and watch their video and click through their free resources. Even if you just implement your own system, there’s SO much useful info to take away from this system and I can tell you from experience that it actually works. I know corralling all of your paper clutter in one place probably goes against everything that feels natural to you about decluttering. If you think that’s bad, you should check out my system to get control of a disgusting house in no time flat. I really encourage you to give this system a try, even if you think it can’t possibly work for you. Speed organizing and decluttering can quickly give you your home back! Do you think any of these tips will work for you? What paper clutter tips work best in your home? Let me know in the comments!